Apple on Tuesday announced the creation of more than 50 new "Today at Apple" sessions for its retail stores, split into three categories: Skills, Walks, and Labs. 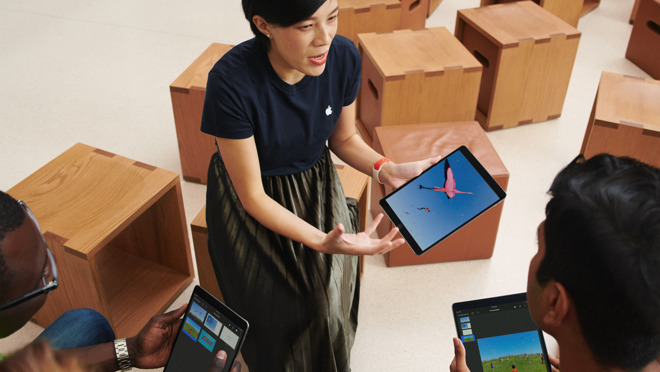 Some of the new Skills sessions include "Notes and Chords with GarageBand," "Sketching Ideas in Notes," and "Photo Editing Techniques," Apple said. Among the added Walks are "Capturing Cinematic Shots," "Creating Soundscapes with GarageBand," and "Staying Motivated," a health/fitness session co-produced by Jeanette Jenkins. Celebrity partnerships are a greater theme in Labs, such as "Beat Making with Swizz Beatz," "Small Screen Magic with Zach King," and "Drawing Treehouses with Foster + Partners." Foster + Partners is Apple's main architectural firm, responsible for many stores and the Steve Jobs Theater at Apple Park. Some kid-oriented sessions in the updated roster are "Fun Family Portraits," "Sphero Robot Obstacle Challenge," and "Make Your Own Emoji." Teachers are being targeted with programs like "App Design and Prototyping" and "Class Projects with Clips." People wanting to sign up for an event must visit apple.com/today or tap the Sessions tab in the Apple Store iOS app. All very heavily weighted towards art and music. There are only "part 1" basics for the various products like the Mac -- and none for things like Apple's Pages or Numbers. I wish Apple would offer more for the average person as well as the student and business persons. Absolutely. Over the past few years classes on how to use your device, various productivity apps, setting up notifications, privacy settings and the like are fewer and fewer. The more features and capabilities that Apppe keeps designing into the devices makes it more challenging to educate their customer base. Suppose the Apple Store Sessions can just do so much. I’d like to see in addition to the Basics and Intermediate iPhone/iPad classes, an Advanced level one. I often find hidden tricks via friends or by accident. I’d like to be able to do a ‘deep dive’ into the full capabilities of the phone.